Septic is simply “sewage or black water” which is general waste water that contains human waste (i.e., from flushing your toilets). I am sure you can guess what the “black” refers to. Grey water is general waste water that does NOT contain human waste (i.e., from showers, kitchen sink, etc.). Properties in built up urban areas usually have a locally shared sewer system available for their use. This is where all waste water discharges to, whether it be from residential or commercial premises and whether it be black or grey water. Property owners pay fees each year, within their Council or Water Rates, to contribute to running these large systems. The property owner is not responsible for any maintenance or running of a shared sewer system. In less built-up areas and rural areas, there is often no facility for property owners to connect to a locally shared sewer system. In this case, the property owner is responsible for the discharge of their own waste water, both black and grey. Let’s just call the waste “septic”. Each property owner needs to instal and maintain their own septic system and ensure the septic system does not impact on any other neighbouring properties. Local Council has stringent septic system regulations that must be followed. There are different grades of septic systems, the most common are (1) a Primary Septic System and (2) an Advanced Secondary Septic System. Your local Council will advise which grade is required at your property. Septic Zone can offer cost effective solutions for both septic types. 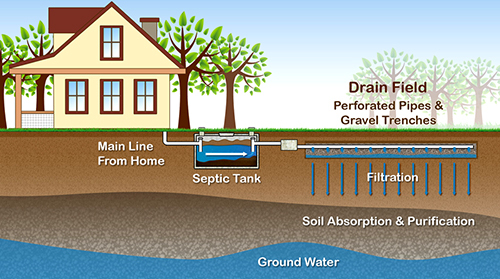 A Primary Septic System consists of a septic tank (supplied by Septic Zone). Your Plumber instals the septic tank (completely buried) then connects the waste water discharge line to a series of PVC pipes laid into a gravel trench. This is a simple system. However, these Primary Septic systems have been known to fail over time and can also create other issues such as bad odour. The benefit of this system – it costs nothing to maintain. The Septic System we provide is called ADVANCED ENVIRO SEPTIC (AES). AES systems also require an Action septic tank, but here’s the fun part. Connect to an AES system and you will achieve Advanced Secondary Septic grading. However, your AES system still works on the principle of a Primary grade septic. What I mean is simply this. The AES system does NOT require any power connection, does NOT have moving parts that are prone to breakdown and does NOT require a regular service agent to check the system and drain your bank account. And NO – it is NOT more expensive to instal than other Advanced Secondary Septic systems. In many cases, it is less expensive. AES is also suitable for small blocks of land. For further information, please call us on (844) 440-8668. Check out our septic information page to find out more about keeping your septic system in check.